- A slim and lightweight tablet case offering all round protection. A unique Bungee Fit System ensures compatibility with most 9.7-10.1" tablets securely holding the device but with access to all tablet ports. The integrated stand enables stable hands free viewing while the cover folds back for single-handed use. 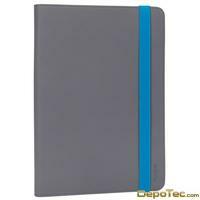 Durable exterior cover and soft lined interior prevents scratches to your tablet.